Guernsey FC manager Tony Vance said he wanted his players to quickly forget about their performance in the 4-0 defeat by Walton & Hersham on Saturday. The defeat was one of Guernsey's worst performances of the season and Vance made no excuses for his team. 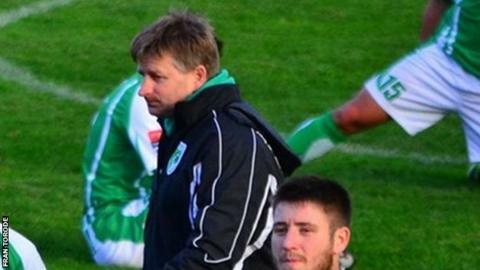 "They deserved their victory and we deserved nothing" he told BBC Guernsey. "The message to the boys is that we move on. It's one of those when you don't even bother to look at the tape or analyse it." The Green Lions have enjoyed an impressive season in their debut campaign in Isthmian League Division One South but the attacking prowess and defensive resolve which have served them so well was absent at the weekend. "There's 46 games in the season and we've had a very bad performance - it didn't happen for us, its simple as that," said Vance. "We were flat at the start and they took advantage of that - they played very well and we were too flat footed and the second goal killed us. "You can pick the bones out of any performance but I just told them to forget this one. We all know it wasn't good enough but I'm not going to rant and rave, we'll move on. "As long as they can get it out of their system as quickly as I can then it'll be fine."